Hello, new member here... and actually I don't have a Chrysler yet... however, I have a deposit on one and am supposed to pick up a 1977 Chrysler 26 a week from today, and will be taking it to Cape Cod for the summer. I am pondering how to get it in the water without putting my truck's rear end in the water. I reviewed the last discussion on hitch extenders (started in 2011) (http://chryslersailors.com/discussion/v ... php?t=3101) and found I was left with a few questions, based on those discussions. So here they are. But first let me mention a caveat. I need to measure the angle of the ramp where I will be loading to know how long an extender I will need. But for the sake of this discussion, let me say I need 10 feet. On the prior discussion one person wrote that he found it just as easy to use a tow cable and to just let the trailer roll backward into the water (with a wheel on the front of the trailer that keeps it straight) as to use a fixed extender. Does anyone have experience with both methods to compare? The second question is for a fixed extender (for launching and retrieving only, not for driving the roads), I noticed people using really large square tubing (3 1/2 inch with 1/4" thickness). I am wondering what other people have used successfully. I was thinking 2" square with 3/16th thickness. Maybe I am thinking wrong, but is seems that the bulk of the forces at play will be tensile strength. Even the tongue weight is removed due to adding a wheel to the trailer. I'd think the cable may not work as once the boat-trailer gets far enough into the water that the boat begins to float the "rolling" will stop. Last fall I evidenced this 1st hand when the coupler on my hitch broke during pull out near the top of the ramp. It rolled backward hard/fast enough to break both "safety" chains and the boat on trailer went into the water free of everything. It stopped almost immediately once in deep enough to lift the boat very slightly off the bunks. This wouldn't have been enough to float free. I did recover using a chain to pull it out and replaced the aged/bad coupler. So for your situation I'd recommend a tube extender allowing you to push boat-trailer far enough into the water to float free. I was wondering if in the situation you described if the trailer had a front wheel on it that did not rotate (thus it would be able to turn the front of the trailer sideways and the front of the trailer would not be dragging), and if the main tires were in sand or a firm surface like concrete? I would love to hear that a cable could work, as the steel fixed keel just adds that much more weight. luckily the front jack with a wheel was down. Cement ramp of what I'd call average slope. Luckily there were no observers to laugh. I have only pulled the C26 out once. Then I used a 10 ft steel extension along with the jack wheel. No problems. I would suggest the heaviest duty nose wheel you can find. The C26 has been and will be a long term project so I have not launched yet. I have two other boats and the Ensign draws 3 ft similar to the Chrysler. I have 25 ft of expanding steel tube or a 25 ft polyester 18,000 lb tow strap. The two strap is so much easier to use I almost never use the steel extensions anymore. No mater what type of extension you use you need some sort of wheel under the trailer nose unless it is very short. Never had any trouble getting the boat down the ramp. 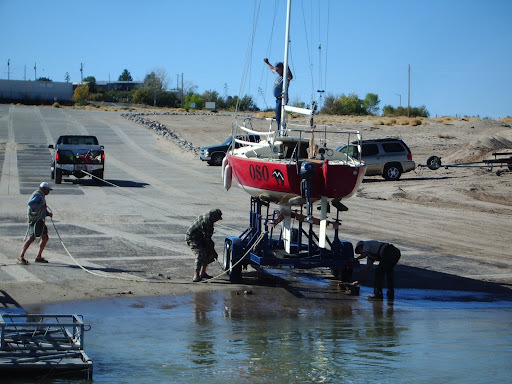 If it is muddy I get up a little speed and maybe have a helper on the dock pulling a rope tied to the trailer. Does using the poly cable create any difficulties in terms of the trailer not going in straight?... or not knowing where the trailer is in terms of aiming the boat for it? Actually it is difficult to steer a long steel extension. You are as likely to bend the extension as turn the trailer. Gravity usually takes care of everything if you get it set up straight on the ramp. For a muddy ramp I sometimes time one rope to the trailer tongue and one on the rear and let a helper steer with the ropes if needed. 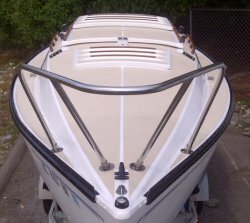 I have keel guides to get the keel in the right spot and just aim for the bow stop on the trailer. In the end, I put a wheel on the front of the trailer and went with a strap to put the boat in and out of the water. It worked well. It also weighed a lot less than a metal extension. Putting chocks behind the wheels of the trailer was quite secure to release the truck from the trailer. Before releasing I put the truck in reverse and nothing moved. Thanks again for the great discussion. I used a 20' strap for my C-26 and it is just long enough for the ramp here. My tires were about 2 feet from the water. A steeper ramp it would be way more than enough. I attach the strap to the chains of the trailer. I bought a special hitch attachment to attach the strap to the truck. I have read that using the ball can be very dangerous as it has the potential to snap an would be like a bullet (a large one at that).